Coffee, Bacon, Flapjacks! : Go For the Eyes, Boo! Go For the Eyes, Boo! With all of the recent talk about eternal projects, and doctors deciding that they don't want to make videogames anymore, I decided to blow the dust off of my old Infinity Engine games, and take them for a spin. Well, two of them anyway: Icewind Dale and Baldur's Gate. After a bit of back and forth, the decision was made that the latter of the two would be the one I'd stick with. They're both great games, but Icewind Dale was a bit more combat heavy than I was looking for. 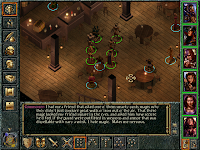 I wanted more conversations and exploration, and Baldur's Gate rounds out the experience a lot more between all of these gameplay elements. And before I go on, I know a lot of people like the sequel better and will be all, "Just skip the first and go straight to the second. It's sooooo much better!" Well, quiet, you! I like the first one, and plan to play it through to the end...or until my nostalgia itch is scratched, and I get distracted by something else. Whichever comes first! What replaying the game has reminded me more than anything else is just how much RPGs have changed in the last 10-15 years. The games have gotten a lot easier, and the pace has been cranked up considerably. Just with the game on the default difficulty I often have to work quite hard to win. It may just be a small group of baddies, but if I go haphazardly running in swords swinging, my party will take a huge amount of damage, and people will die. Well, maybe not so much when fighting kobolds or xvarts. They're just a nuisance. Against some ogres or hobgoblins or the like, especially when they may out level your party a bit, beware. Tactics, and smart use of spells becomes the order of the day. Have badly injured characters fall back to be healed, buff where you can, be prepared with the right spells, and most importantly don't be afraid to run away. 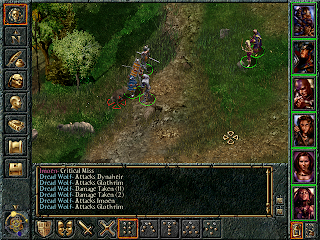 It's really not like RPGs today where players are charging headlong into danger, cutting down everything in their path, and feeling like a badass after, with maybe the occasional boss fight that is sorta kinda tough. 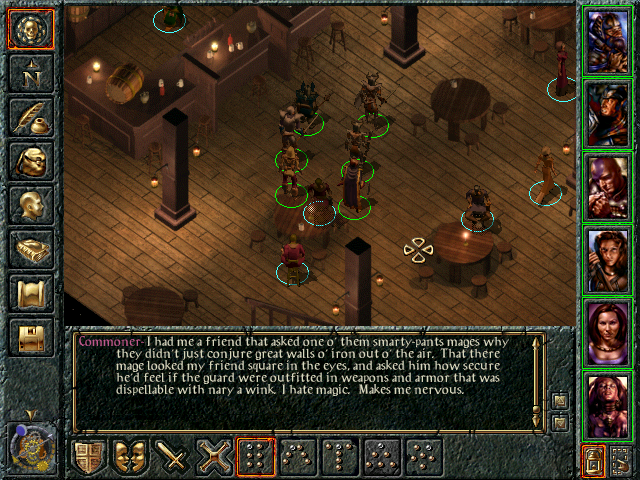 In Baldur's Gate it really feels like the world is a dangerous place. There are no lack of baddies out there that are ready, willing, and able to smash your party to pieces (especially when they're turned to stone). It takes a lot more thought and skill to wade through this game than a lot of modern RPGs where it feels like players are being presented with 10-20 hours worth of monsters to smash in the face before hitting the ending credits. It's actually really satisfying to be pushed this hard. Then there's the whole pacing thing, as games of this period flowed a lot slower. You could go for a nice stroll through town and have chats with countless NPCs while soaking in the local ambience. Even venturing into the wilderness, a fortress, caves, or whatever was a slower, more methodical experience. Leveling is also a big thing in the game (as is getting new, more powerful weapons). It's a few hours in before party members even begin to reach level two. Heck, I'm still waiting for Dynaheir to hit level two on my current play through. My point, though, is that leveling up means something in this game. It's a very much needed boost to characters' stats and abilities, not just a steadily growing number that is so easy to take for granted in other games. That level up could make all the difference between getting wiped out, or just barely making it past that one pack of monsters. 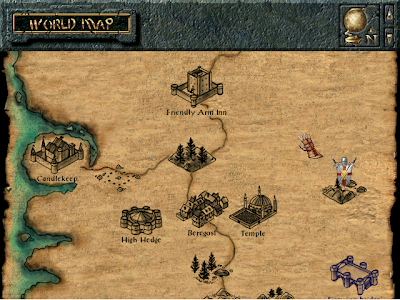 Grumpy old guy talk aside, it's been fun poking my head back into Faerun. There are so many likable characters here like Minsc, Khalid and Jaheira. I usually stick to them Imoen, and Dynaheir when I play the first game, at least when I try and be a good guy (kinda tempted to do an evil player too). The visuals are still a pleasure as well. I'm sure some don't like the simplistic look of it, but I love the forests in the game. The trees look so good to me. But, yeah, just had to type out some thoughts on the state of RPGs then and now, and how much this game has reminded me just how the genre has changed over the last decade or so.